In case you didn't know, this April (1-28) is RadioShack's Mobile Makeover Month, which aims to help you get rid of some unused technology by guaranteeing a minimum $30 (and a maximum $300) trade-in value for your old gadget, upon purchasing a new one. You can trade-in all kinds of working gear: phones, cameras, MP3 players, etc., so no matter what old tech you have lying around, it should be good for at least a $30 store credit. Of course, there are the usual restrictions to this promotion, which you can check out in the press release below. You can trade your old device in at a retail RadioShack location, or online here, where you can also determine the value of your device. 2. If you haven't already, please Like our Facebook page, and post your answer as a comment to the picture that you'll find through this link. And that's it, you've now entered the game and have a chance to win! The two lucky fellows will be chosen randomly next Wednesday (April 18) and will be contacted via a private message in Facebook. *Update April 18th 2012* We've drawn the two winners; Anthony and Chris, please check your private messages! America’s Mobile Makeover Month by RadioShack runs April 1–28, 2012, at participating RadioShack stores nationwide and will also feature additional trade-in specials in weekly circulars available online each Sunday during the promotion. Guaranteed minimum trade-in values are available only through April 28, but RadioShack’s hassle-free Trade & Save Program is available every day. Items turned in through RadioShack’s Trade & Save Program are recycled or refurbished, saving consumers money while diverting tech trash from the waste stream. To learn more about RadioShack’s Trade & Save Program or to appraise your device, visit a nearby RadioShack, go to radioshacktradeandsave.com, or download the free RadioShack Trade & Save app in the Apple App Store or Google Play for Android. My 1st cell phone was an LG TM-510. Worked well and had it for a long time. Don't have it anymore because the hinge snapped. 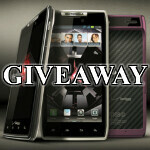 I refuse to Facebook so I guess I'm out of the giveaway, but I'll still share my first phone here anyhow. Stationed in Korea back in '99, my first phone was a prepaid G2 phone by Hanwha. The retailer had to write the instructions down in English for me on a post-it to attach to the interior of the flip cover. Sadly, it did not survive an around-the-world Myung Jin [drunk] bus trip back to my post. Still have it's replacement in storage though. My first cell phone was through AT&T and it was constructed of a long clothes line with paper cups on either end. And, yes, still used by AT&T; it's their flagship device. Nokia 1209 is My First cell phone and still i am using it along with another Nokia X2 which baught just 1 year back. Another US only giveaway. If I'm willing to pay for shipping would I be able to compete ? No joke, I'm serious. The old brick phone! And no, it long gone. Motorola Krazr. Wanted to be different and not get the RAZR like everyone else. Still have it. my firs phone was a very basic phone. I throw it away long time ago. First Phone: NOKIA 6110 and it's been long gone! I need a new phone though! Samsung SCH-A650! It was an extremely tiny no camera having silver flip phone with the best cell reception I have ever had! I lost that phone twice and it came back to me! One time it fell off the back of my brother's vehicle bumper where I left it and ended up on the interstate while we were on the way from Louisiana back to Alabama and a road worker found it and actually mailed it back to me! One of the hinges was a little damaged but it got me through to my next upgrade! My first phone was the Kyocera Candid for cricket. It's still in my house somewhere. Nokia 252, Still have it. It was a TracFone and I'm pretty sure it didn't have text messaging on it. But I was in middle school and had to have a cellphone. My first phone was a motorola T120 flip phone. i still have it somewhere but it doesnt work. \ NOKIA 6110 and it's been long gone! So sad that only us residents can join... should I have to buy a airplane ticket to go us from s.korea? I never had a smartphone before because I was in the military... This would be my first one if I win.